NOTE: Holidays (except for the New Year’s Day and New Year’s Eve services) are observed at MBT on the Sunday closest to the specific date of the holiday. Join us in bringing in the New Year with a renewed appreciation for the spiritual guidance of the Three Treasures (the Buddha, the Dharma, the Sangha). Ho-on-ko is the annual memorial service for Shinran Shonin, the founder of the Shin Buddhist tradition. This service expresses our gratitude to Shinran for showing the Path of the Wisdom and Compassion that is Amida Buddha. The observance began after Shinran’s daughter, Kakushin-ni, carried on the administration of Shinran’s mausoleum, as did her descendants, who ultimately became the Monshu of the Hongwanji sect. (The Monshu in Jodo Shinshu Buddhism is the guardian of Shinran‘s mausoleum, as well as the head of the sect. As of June 2014, the current and 25th Monshu of the Nishi Hongwanji temple is His Eminence Sennyo Shōnin (Ōtani Kōjun, born 1977). He succeeded his father Sokunyo Shonin (Otani Koshin, born 1945). Ne-han-e is the annual memorial service of Shakyamuni Buddha, the founder of Buddhism who died at 80 years of age. After his death, his disciples gathered from all directions and divided his cremated remains into eight parts. They enshrined these parts in stupas in order to preserve the memory of the Buddha. Over the centuries, the ashes were divided and re-divided many times. The stupa at the Buddhist Church of San Francisco enshrines a small portion of the Buddha’s remains that was donated to the Buddhist Churches of America in 1935 by the King of Siam (now Thailand). Note: Japanese Buddhists and Mahayana Buddhists, in general, observe Shakyamuni Buddha’s birth (see Hanamatsuri), Enlightenment (see Bodhi Day) and death on three separate dates. The Theravada tradition observes all three events as having occurred in the first full moon date of the fifth month, a major holiday known as Wesak or Visakha. Higan-e is a service held twice a year, at the spring and fall equinox. The equinox is when the weather is mild, not too hot and not too cold, and when nature is in harmony. Thus it is a time for reflection and meditation on this harmony in one’s own spiritual life. Rather than the traditional celebrations of Mother’s Day and Father’s Day, the Midwest Buddhist Temple usually recognizes mothers and fathers in early May at a “Parents Day” Service where graduates are also honored. This service also includes Hatsumairi or First Service presentations. At Hatsumairi, not only do parents present their child to the Buddha but also there are presentations of individuals who want to publicly acknowledge their first service as a follower of the Three Treasures. As part of the Buddhist Council of the Midwest, there is an annual celebration of the Theravada tradition of the combined birth, Enlightenment and death of Shakyamuni Buddha. Go-tan-e celebrates the birth of Matsuwakamaro Hino, who became a monk at the age of 9 after the death of both of his parents. He went on to become known as Shinran Shonin and his descendants went on to found the Shin Buddhist (Hongwanji) sect. There was a time when, due to discrimination, Japanese and Japanese-American Buddhists could not obtain burial plots for their deceased loved ones in the Chicago area. The Japanese Mutual Aid Society of Chicago formed a partnership with Montrose Cemetery to purchase sections of the cemetery with individual plots to be sold to Japanese-Americans. Each Memorial Day weekend, the Japanese Mutual Aid Society hosts a community-wide memorial observance at Montrose Cemetery. Buddhist Churches of America Bishops Memorial. There is not a recognized translation of the word Obon. “Bon” is part of the sound of the Japanese pronunciation of the Ulambana Sutra, and “O” is the Japanese honorific placed in front of important words. In the Ulambana Sutra, a disciple of the Buddha, Mogallana danced with joy after understanding the true meaning of Compassion. Obon is also known as Kangi-e, which means “gathering joy” in Japanese. 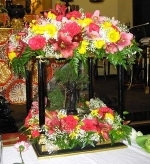 Over the centuries, a festival became included with the Obon Service. The festival included local folk music and dance (Obon Odori) in which a town or village or temple would dance in memory of their ancestors. Hatsu-bon or First Obon, is important for families who have lost a loved one in the previous year. This observance would be the first Obon since the passing, and the Obon Odori is a way of expressing gratitude for the benefits our loved ones have already shared with us. The Hatsu-bon is also a physical expression of both the grieving and the joy of spiritual understanding. Usually held on the Obon weekend, this annual memorial service is held to remember our non-human family members and to remind us that all sentient beings have Buddha-Nature (the potential to become a Buddha). See Shun-ki Higan-e (Spring Equinox), above. This memorial service pays tribute to all our predecessors. We honor the known, the unknown and members of the Sangha who have contributed to the growth and development of the temple. Bodhi Day celebrates the day that Siddhartha Gautama discovered Enlightenment and became Shakyamuni Buddha. By his example, Siddhartha showed us that it was possible for a human to become a Buddha, a Perfectly Enlightened One. This is the first day of the Buddhist religion. The annual memorial for Rev. Gyodo Kono, the founding minister of the Midwest Buddhist Temple. Join us for a short service, after which we take turns striking the kansho bell outside the hondo 108 times to complete the old year and ring in a fresh New Year. Then enjoy a traditional meal of buckwheat noodles, which symbolize longevity. For times and dates, check the MBT calendar or contact us at office@mbtchicago.org or call 312.943.7801.